Things slow down in the garden during July. I’ve found that there is not much to do besides letting what’s growing continue to grow, and to get ready for the later months, once the risk of frost has reduced and the soil lifts in temperature. 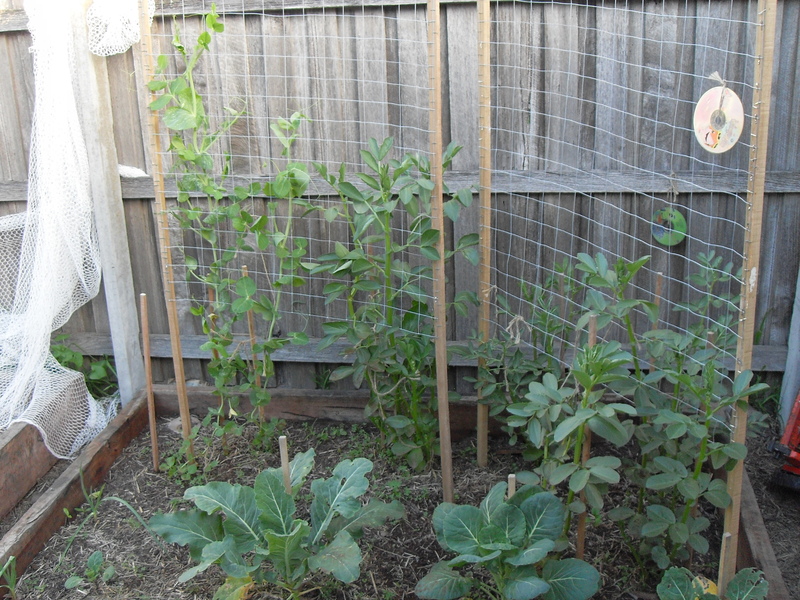 In spite of the season, the snow peas have just started to flower, and along with the broad beans, they seem to appreciate the framed trellis. Below those are the brussel sprouts, which are getting decent growth. One thing I will need to change is the use of this plot (2), which suffers from a lack of sunlight during the cooler months. Most likely, this will lay fallow for several months of the year, and I’m considering adding another plot (3), to go on the other side of the yard which gets year round sun. Another view of plot 2 with the Shane made wind breaks visible. The polystyrene boxes behind those were given to me by the local fruit and veg shop, with several more waiting to get to work on tomatoes for the coming spring. 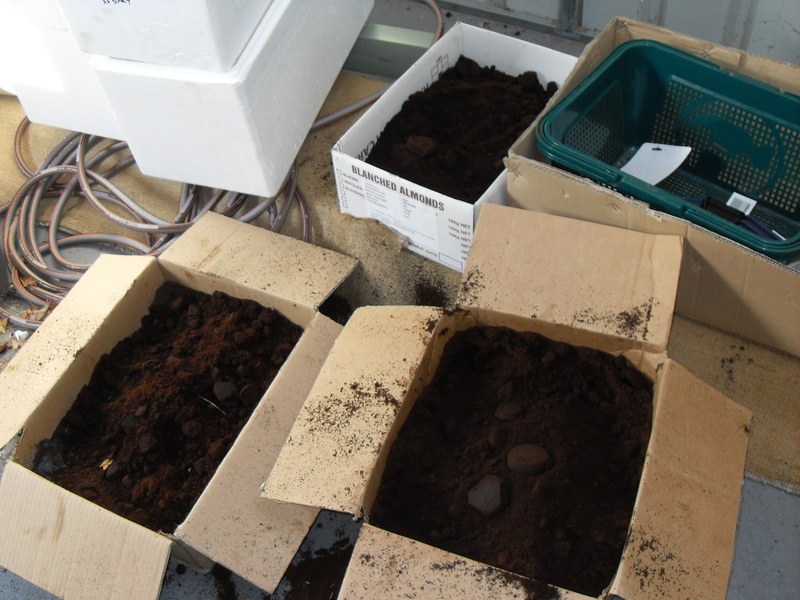 I set-up one of the boxes with a rudimentary wicking system, which allows water to be drawn upwards via capillary action to the plants’ roots. 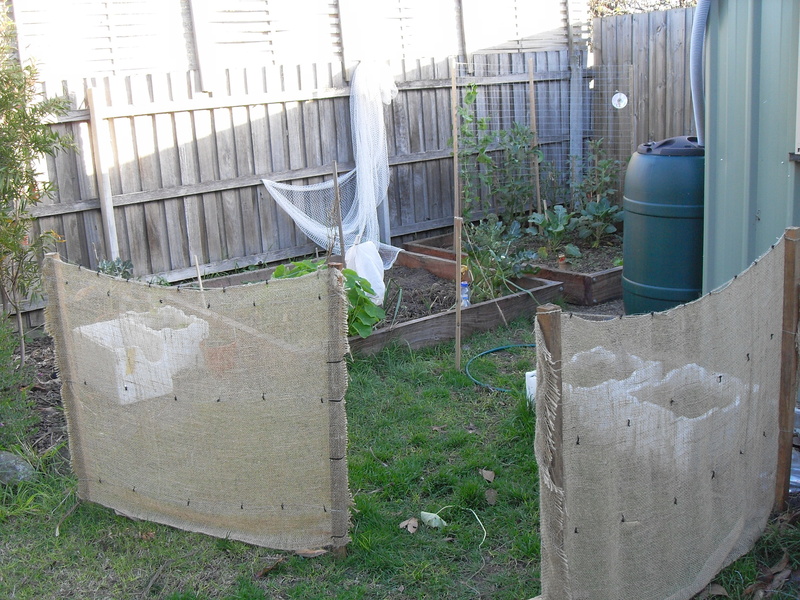 Some good sites for how to construct a wicking bed are here, and especially here. Also some good info at the Warrandyte chat blog here. Each cake is a reminder of the impact each of us have when drinking espresso coffee (that is from just one latte). 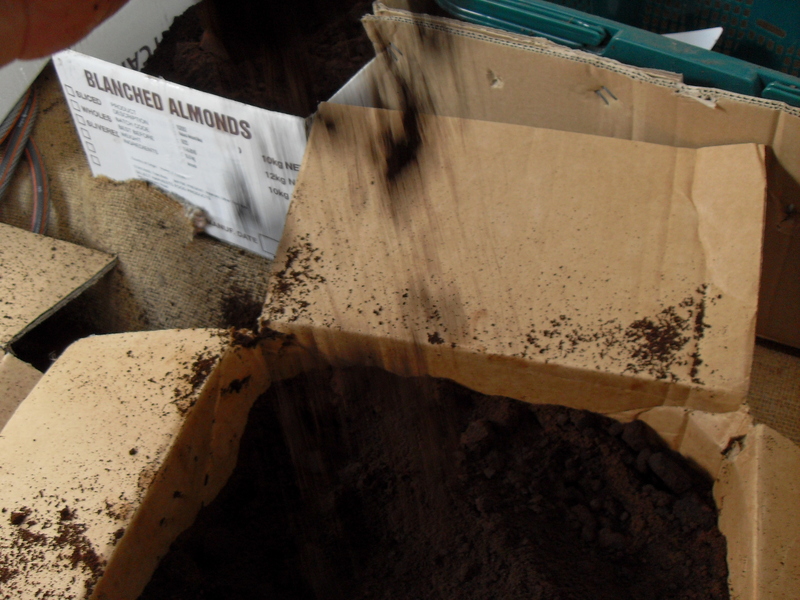 Getting large amounts of coffee grounds can be a logistical challenge. Actively managing what I collect is the only way to make it sustainable over the long term. Look it falls from the sky! 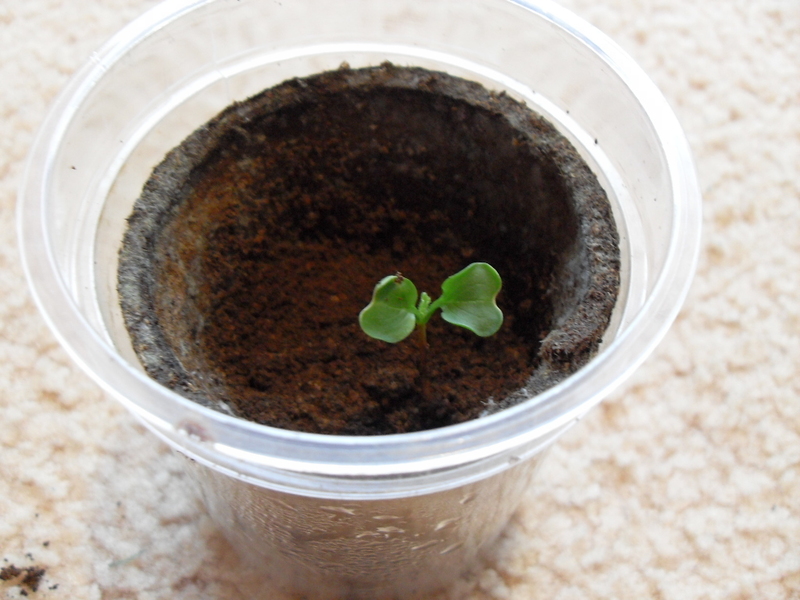 I was reading about how some things can grow in pure coffee grounds, and this radish is an example of my attempt. Out of the three seeds, only this one came through, and am now testing success rates with a 50/50 blend of coffee grounds and regular potting mix. What normally greets me from a weekly pickup at the local cafe. That is from just one week – 60 litre bin – all full. So guys – that’s the garden for the month. If you have any questions about the setup or some tips to pass on, just add these to the comments below, and I will be sure to write back to you. Tags: coffee, coffee grounds, garden, July. Bookmark the permalink. Hey Shane, I liked your story about the coffee grounds and how you can reuse them..I throw out my every day coffee grounds outside on the ground, apparently the gardens do like the coffee grounds. Some don’t. I would like to hear more about your experiments. My grandmother used to save all of her organic kitchen waste including coffee grounds, egg shells and vegetable scraps and bury them every day in her garden. can we at the very least bury or sprinkle our coffee grounds among the rosebushes etc ? Any disadvantages. Is it better to bury? What about varmants and critters? Yes you can and the roses will love you for it. 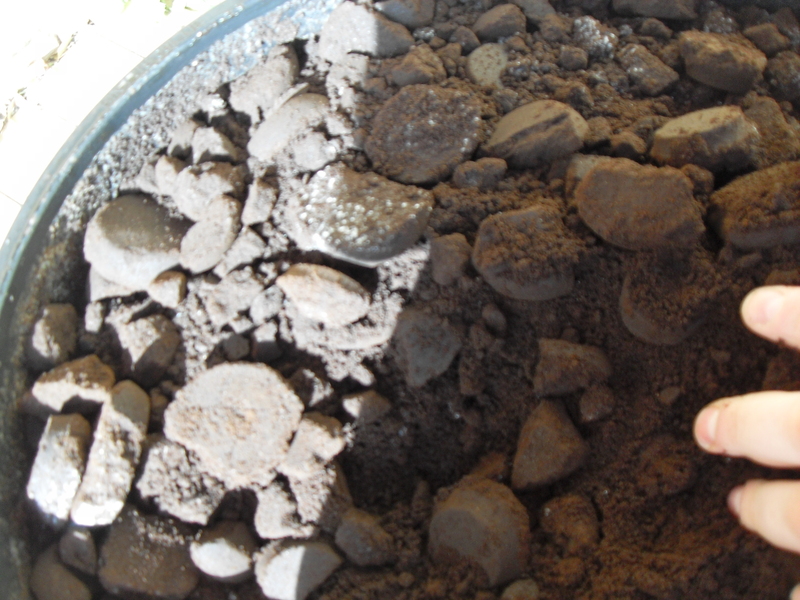 Best to dig it in a little, a few inches in with the rest of the soil should do it. 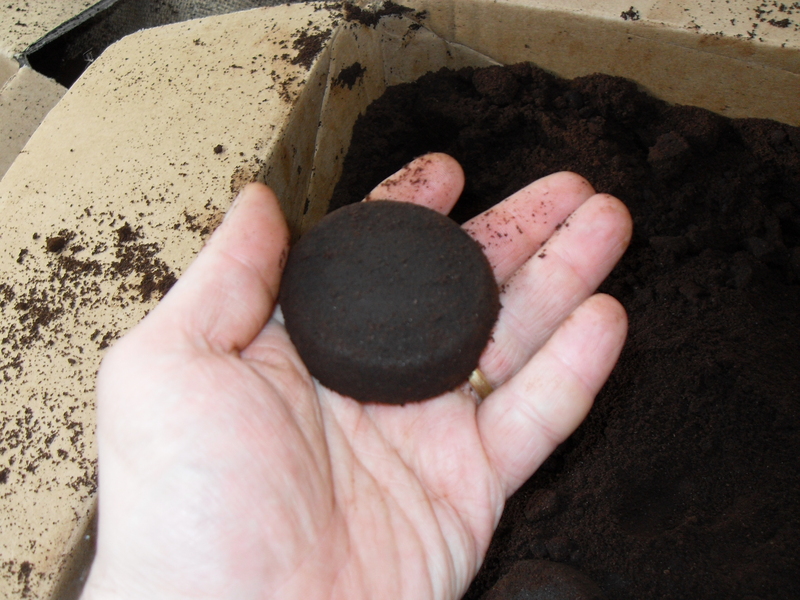 Not sure if you had a chance to read my ‘ground to ground’ post, but in that I go into some more detail about how to apply coffee grounds directly to the soil or to the compost.